Washington, DC based Blues& Roots band, The Nighthawks: Mark Wenner, Paul Bell, Johnny Castle, and Mark Stutso, have a new release out entitled, All You Gotta Do, on the EllerSoul Records label. As a fan of Blues harmonica, I really appreciated this stellar 12-track release. A combination of new songs written by the band, as well as some old-time favorites, give The Nighthawks - All You Gotta Do, the right mix of play for an enjoyable listen. 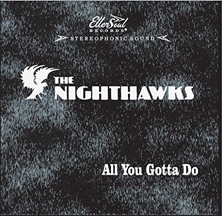 The Nighthawks produced, All You Gotta Do, on the EllerSoul Records label, along with Executive Producer H. Watkins Ellerson. For those who are new to The Nighthawks, Mark Wenner founded the band in Washington, DC back in 1974, and although the other original members have moved on, Mark Stutso came on board in 2010, and veteran musicians Paul Bell and Johnny Castle joined to round it out, the music remains true to the core. Mark Wenner is a master of Blues harmonica, Mark Stutso keeps the beat as the drummer, Paul Bell is the guitarist with super-charged riffs, and Johnny Castle lays on the bass. As they write on the album cover, "everybody sings." The band opens the release by taking the listener down musical memory lane with the rocking and rollicking track, That's All You Gotta Do. Written by Jerry Reed, Brenda Lee recorded it in 1960, and it hit the number 6 spot on Billboard Hot 100, which the band deftly covers and makes their own. Next in the play list is the heartfelt Larry Campbell song, When I Go Away, which he had written for The Dixie Hummingbirds. The song is about death and moving along, with inspired lyrics "...Don't want no sorrow ... I don't want no crying, only tears of joy ...And I'll be bound for glory, In the morning when I go away..."
The band segues into another 1950s song, Baby I Want To Be Loved, written by Willie Dixon back in 1955. Bring on the Funk for this one, which had me cakewalking as I gave it a listen. Let's Burn Down The Cornfield written by Randy Newman in 1970 with its harmonica up front, band harmonies, and tight guitar riffs, gives this track staying power. Band member and bass player Johnny Castle shows his talent as a songwriter with his original upbeat, punchy, Another Day, about politics, the states of affairs, and Big Brother watching, followed by another band original, VooDoo Doll written by Mark Stutso. The band continues their tour through the past with the fabulous 1957 Sonny Boy Williamson song, Ninety Nine. Time to take it slow, the band downshifts into the ballad, Three Times Your Fool written by Norman Nardini and Mark Stutso, so cozy up with your loved one or grab them and slow dance to this one. Next, is the 1977 Jesse Winchester song, Isn't That So, followed by the mostly instrumental Snake Drive, written by R.L. (Robert Lee) Burnside (1926- 2005) and Kenny Brown, which showcases the band's musical prowess. Coming into the home stretch, with track number 11, is Mark Wenner's, Blues For Brother John, which slides into the groove with a slow Blues number. Closing out the release, the band slides into the 1966 song, Dirty Water, written by Ed Cobb and released by The Standells, and let's face it, who does not love the song, Dirty Water? It is a perfect close to a release that is well worth sitting up, paying attention, and giving it multiple listens. Websites where you can procure The Nighthawks - All You Gotta Do: Amazon, Barnes & Noble, Blues Music Store, and cdUniverse.